Calcium (Ca2+) is a versatile second messenger that controls a range of cellular processes—from pollen tube growth to stress responses—by regulating the activity of various proteins. Although Ca2+ is present at millimolar concentrations in the cell wall and vacuole, a set of channels, pumps, and buffers keeps the cytosolic free Ca2+ concentration ([Ca2+]cyt) low (in the nanomolar range). Stimuli such as touch, auxin, and high salinity trigger sharp localized increases in [Ca2+]cyt. It is unclear whether these Ca2+ signatures, which have distinct amplitudes and temporal patterns, operate in isolation or if they rely on other second messengers (e.g., H+, inositol triphosphate, and H2O2) to transduce highly specific messages. [Ca2+]cyt signatures have been linked to cytosolic pH (pHcyt) changes in guard cells (Blatt and Grabov, 1997), pollen tubes (Michard et al., 2017), and roots (Monshausen et al., 2009). Now, in a Breakthrough Report, Behera et al. (2018) present evidence that cytosolic pH changes are a consistent feature of Ca2+ signaling. Using a set of genetically-encoded fluorescent sensors to track Ca2+ and pH dynamics in Arabidopsis thaliana seedlings, the team demonstrated that stimuli known to elicit Ca2+ transients affect pHcyt too. 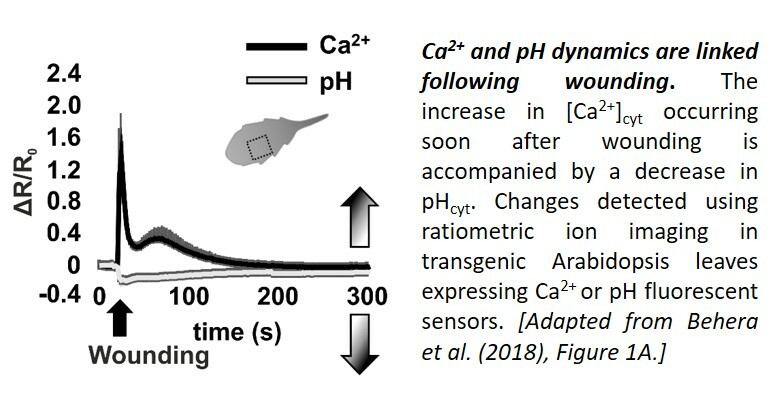 First, they showed that leaf wounding, which elicits a Ca2+ transient with two peaks (Beneloujaephajri et al., 2013), resulted in cytosolic acidification, with a pHcyt minimum close to the first Ca2+ peak (see figure). Second, they demonstrated that perfusion with ATP caused a sharp increase in [Ca2+]cyt, followed by a pHcyt minimum about a minute later. Third, they showed that the [Ca2+]cyt increase triggered by auxin treatment was followed by a dip in pHcyt about half a minute later. In each case, a [Ca2+]cyt increase was associated with a reduction in pH of 0.1–0.25; however, the timing and amplitude of the changes differed. Next, the researchers manipulated the Ca2+ signature to examine whether the [Ca2+]cyt and pHcyt dynamics are linked. The aca8 aca10 mutant, which lacks two plasma membrane-localized Ca2+-ATPases, had a normal resting [Ca2+]cyt, but a reduced and delayed [Ca2+]cyt increase following ATP stimulation. Strikingly, the change in pHcyt following ATP treatment had a similar decrease in amplitude and rate, suggesting that the Ca2+ and H+ fluxes are indeed tightly linked. Prompted by the finding that cytosolic Ca2+ transients elicit Ca2+ increases in intracellular compartments (Loro et al., 2012; 2016), the authors examined whether Ca2+ and pH signatures were also linked in the stroma of mitochondria and plastids following stimulation with ATP. The timing and amplitudes of Ca2+ transits differed in the cytosol, mitochondria, and plastids. By contrast, the speed and magnitude of the pH decrease was almost identical in the three compartments following ATP treatment, but slightly delayed in the two organelles. Thus, the link between Ca2+ and pH dynamics appears to be modified in endosymbiotic organelles. The authors discuss several possible mechanisms that could link the Ca2+ and pH signatures in the cytosol and alter this connection in organelles. These findings add a level of complexity to calcium signaling that opens exciting research avenues. If changes in pHcyt are part of the mechanism by which Ca2+ transduces complex and highly specific information, other second messengers could contribute to this process too. Blatt, M.R., Grabov, A. (1997) Signal redundancy, gates and integration in the control of ion channels for stomatal movement. J. Exp. Bot. 48: 529-537. Beneloujaephajri, E., Costa, A., L’Haridon, F., Métraux, J.P., Binda, M. (2013). Production of reactive oxygen species and wound-induced resistance in Arabidopsis thaliana against Botrytis cinerea are preceded and depend on a burst of calcium. BMC Plant Biol. 17;13:160. Behera, S., Zhaolong, X., Luoni, L., Bonza, M.C., Doccula, F.B., De Michelis, M.I., Morris, R.J., Schwarzländer, M., Costa, A. (2018). Cellular Ca2+ Signals Generate Defined pH Signatures in Plants. Plant Cell; 10.1105/tpc.18.00655. Loro, G., Drago, I., Pozzan, T., Lo Schiavo, F., Zottini, M., Costa, A. (2012). Targeting of Cameleon to different subcellular compartments reveals a strict cytoplasmic/mitochondrial Ca2+ handling relationship in plant cells. Plant J. 71;1-13. Loro, G., Wagner, S., Doccula, F.G., Behera, S., Weinl, S., Kudla, J., Schwarzländer M., Costa, A., Zottini, M. (2016). Chloroplast-Specific in Vivo Ca2+ Imaging Using Yellow Cameleon Fluorescent Protein Sensors Reveals Organelle-Autonomous Ca2+ Signatures in the Stroma. Plant Physiol. 171: 2317-2330. Michard, E., Simon, A.A., Tavares, B., Wudick, M.M., Feijó, J.A. (2017). Signaling with Ions: The Keystone for Apical Cell Growth and Morphogenesis in Pollen Tubes. Plant Physiol. 173: 91-111. Monshausen, G.B., Bibikova, T.N., Weisenseel, M.H., Gilroy, S. (2009) Ca2+ regulates reactive oxygen species production and pH during mechanosensing in Arabidopsis roots. Plant Cell. 21: 2341-2356.